There's nothing more frustrating than finding an exciting new technology that will improve the way you run your organisation, only to discover that it comes at an incredible expense. Lots of companies promise the earth when it comes to their solution's capabilities - but they also want to charge you the earth to benefit from it. At ResourceSpace, we're different. Unlike many other tech companies, our Digital Asset Management (DAM) software is free for organisations to use. Whether you're a multi-million pound corporation or a not-for-profit start-up, you can benefit from the same market-leading solution for uploading, sorting and sharing essential media files. How - and why - is ResourceSpace free? We created ResourceSpace to give organisations of all different sizes and sectors the opportunity to manage important documentation more effectively. Our free software has no annual license fee, and an unlimited number of users. We released it under an open source license to enable talented developers to enhance its features and functions. This means ResourceSpace users have two choices, depending on what you want to get out of your DAM software. You can either plug our out-of-the-box software straight into your organisation, and use it just as we've built it; or, if you are a larger company with an in-house IT or technology team, you can enable them to add bespoke functionality using our open source access, to create something more customised. There's no 'one size fits all' approach either - we have different pricing packages available, depending on your budget and technical needs. What makes us unique in our free-to-use approach? 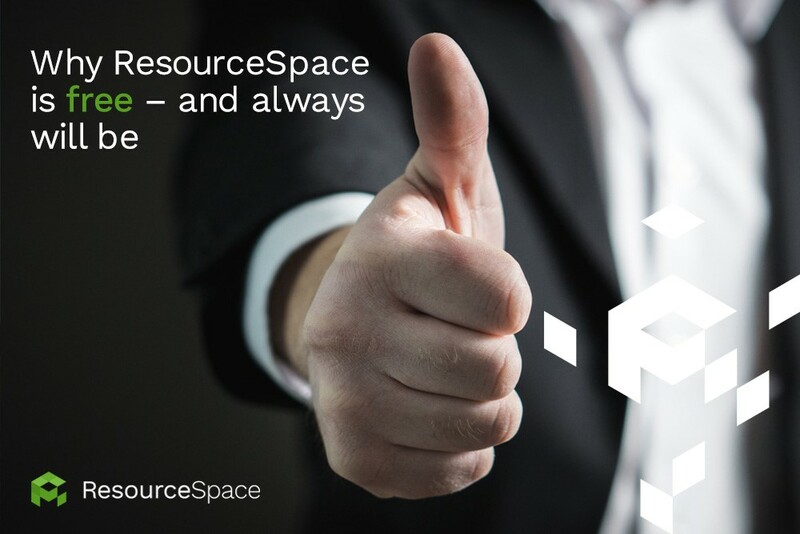 ResourceSpace is an industry trendsetter; for years we've been giving organisations free access to our DAM solutions. We've never charged for access to our software, and we never will. In fact, our approach has been so successful that other DAM software providers are now starting to give versions of their software away for free. Indeed, some are claiming that they're the first tech companies to offer their solution free of charge, but we know that's not true. At ResourceSpace, we promise to always deliver high quality DAM software free of charge to our customers. See for yourself how our free, open source software works and sign up for a ResourceSpace trial. You can also find out more about the additional services we offer by visiting our pricing packages page, with monthly and annual subscriptions to suit your organisation.